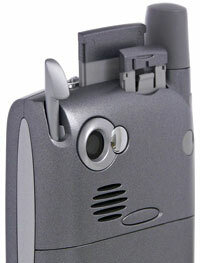 Palm Treo 650 - why I still love the Treo - Usability and ergonomics. 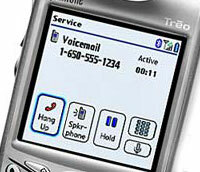 Getting down with the Treo's usability and form factor. As its rivals continue their crash diets and squeeze into ever-smaller designs, there's no doubt that the Treo's beginning to look like a bit of a lardy boy these days (although it's by no means the biggest smartphone out there). Smartphones, by definition, need a big bright screen to fit all the information in (and at 320 x 320 pixels, the Treo's got one of the largest displays around) but there's a human limit to how small you can make a keyboard because of the size of our fingers. Some smartphone makers have tried to get around this limitation by getting rid of the keyboard altogether and using an onscreen 'soft' keyboard instead. Although this allows designers to make super-small smartphones, the lack of a proper keyboard is - to quote Clint Eastwood - some price to pay for being stylish. Soft keyboards are absolutely horrible to use. Apart from the fact that your screen rapidly turns into a smudgy mess, they're simply not as effective as a proper hardware keyboard, and after using both, we'd certainly never again invest in a smartphone without a proper keypad. 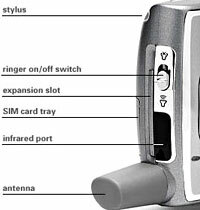 Despite its 'built for comfort' shape, the Treo still feels pretty good in the hand, with some of the best ergonomics around - changing the SIM card, for example is an absolute breeze compared to most phones (just use the slide out tray, accessible from the top of the phone), and it's the same story for the SD card. Volume controls are where they should be - on the side of the phone - and muting the phone entirely is simply a case of sliding a switch in the top of the phone, a feature that is inexcusably absent in almost every other phone. It's not all good though, with the Palm designers needlessly forcing users to take off the back of the phone whenever a reset is needed. And then there's that great, chunky monolith of an antenna that's bolted on to the phone. Funnily enough, it seems that a lot of Americans actually like antennas on their handsets, but we can't say we're too keen. Of course, pretty looks and bright screens are one thing, but it's how the thing works as a phone that matters most and here's where the Treo excels. 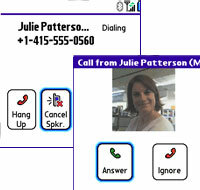 If you want to switch to the speakerphone during a call, just press the ruddy great onscreen 'speakerphone' icon. No holding down keys, no shuffling about in sub-menus or fiddling about with switches like a Windows phone. If you want to see who's called you, just press the green call button twice and a list of calls comes up. As you scroll down the list, context sensitive buttons appear, asking if you'd like to add the unknown numbers to your contacts, or if you'd like to send a SMS message to known contacts. If you want to find out more, click on 'details' and you'll get the exact time and duration of the call. Looking someone up in the address book is just as simple - just type in their initials and you'll go straight to their entry. The whole phone is designed for effortless one handed operation, meaning you can use the phone on the move while most Windows Mobile users will be left reaching for their itty-bitty stylus or fiddling about with slide-out keyboards or (shudder) 'soft' onscreen keyboards. Get 'em quick before they go! Since we started this piece, Palm have announced that there will be no further European shipments of Treo 650s as the phone breaches new EU regulations. Palm has said that its next Treo smartphone will be targeted at European markets, although it appears that it won't be a GSM/UTMS version of the 700p. Instead, Palm are rumoured to be developing an antenna-less Treo for the European market, possibly to be called the Treo Nitro. 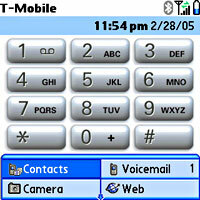 Palm CEO Ed Colligan has suggested that the new model is unlikely to become available until Palm's 2nd Quarter in FY 2007 (around October - December 2006). Readers sufficiently enthused by our comments should look on eBay where there are ample new and reconditioned Treo 650's available for between £170-£280 (that's where we got ours from! ).